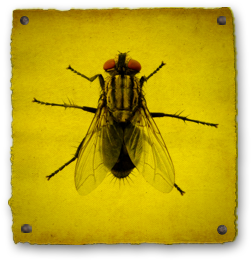 House flies are always found with humans or human activity. There are public health issues and diseases associated with house flies. Under ideal conditions, there can be 10-12 generations in a summer. Good sanitation is critical to reducing the incidence of house fly problems. Keeping food in sealed containers, maintaining properly sealed garbage containers, and making sure that window and door screens are in good order will all help to reduce house fly incidence. Outdoors, proper maintenance of compost piles and eliminating lawn clippings can help reduce house fly infestations.